So, a new month, a new spirit, and a new world of cocktails to try. Last month, I focused on gin, a spirit I was well-acquainted with. So this month, I wanted to work with a spirit I haven’t had any experience with: rye. Rye is a traditionally American whiskey made, you guessed it, primarily from rye. Contrasted with bourbon, another American whiskey, rye is generally less sweet and usually has spicier notes. It’s also drier than it’s corn-based cousin, and, in my opinion, that makes it better suited for more cocktails. Instead of having to fight with the sweetness of a bourbon, it’s much easier to compliment the rye and really let it shine. 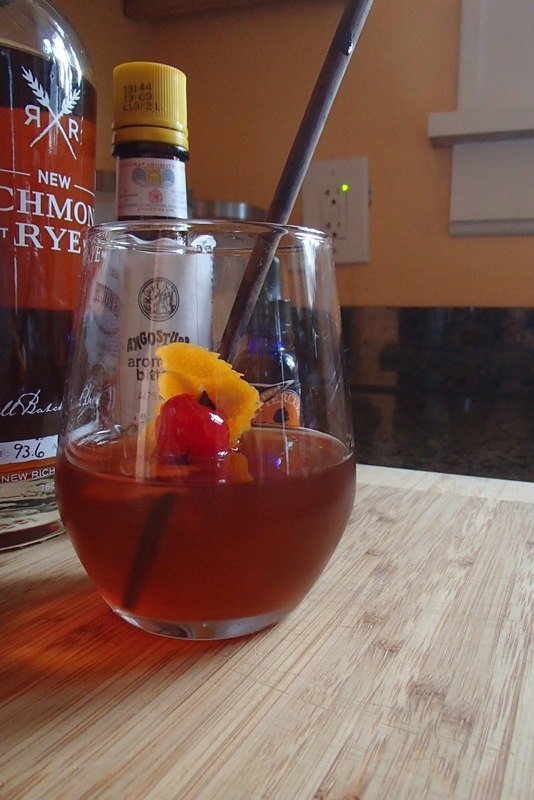 Rye was also the whiskey of choice for many classic cocktails before Prohibition. For a while, using rye in cocktails was forgotten; bourbon was used instead. But relatively recently there’s been a resurgence, and rye is once again the spirit of choice for Old Fashioneds, Whiskey Sours, and this week’s cocktail: the timeless Manhattan. The Manhattan is a very simple cocktail with plenty of room for variation. 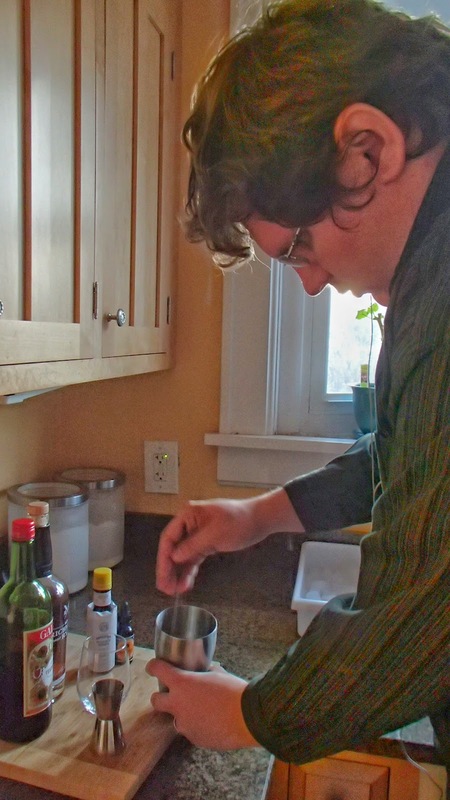 The base recipe contains nothing more than rye, sweet vermouth, and Angostura bitters. 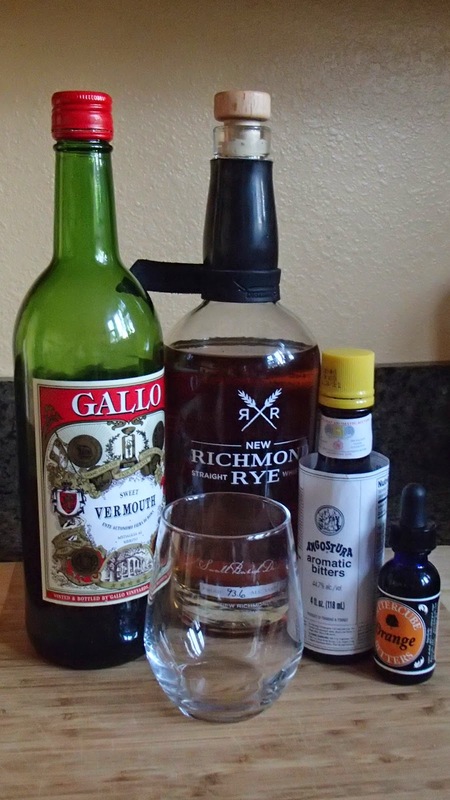 The amounts may vary, but I stick to the most common 2:1 rye to vermouth. And I enjoy adding a little orange bitters for some extra complexity. Take your ingredients and build them in a mixing glass filled with ice. Stir, then strain into a glass. I was working fast to try and catch the last of the evening’s light, so no building pictures this time. Some quick notes on stirring: it’s different than stirring any other kind of drink. You want to combine and chill the ingredients with some, but mostly minimal dilution from the ice. To do this, take something long and thin (like a chopstick, as pictured), insert it into the glass along the edge, then spin the ice to form a little whirlpool or vortex in the middle. Here’s a video showing how to properly do it. He goes into more detail than the average home mixologist will need to, but it’s a helpful guide nonetheless. Anyway, back to the drink. Garnish your Manhattan with a twist of either lemon or orange, or with a cherry. Or with both, like I have below. Probably the prettiest drink picture I’ve ever taken. The first taste experienced is a little sweet from the vermouth, but that quickly dissipates into the spice and the wood of the rye. The Angostura bitters help make it a Manhattan: they keep the sweet from the vermouth from taking over the rye, and they accent the rye helping bring out notes of fruit and the barrel to the forefront. The orange bitters help round this out, adding an additional layer to the drink and softening the bite of the rye a little, but not so much that you can’t tell exactly what you’re drinking. This is a drink you could have ordered with confidence and received before the turn of the 20th century. Over 100 years later, this drink is still relevant, still appealing to (at least) my palate, and most importantly, still delicious. Do you have a favorite variation on the Manhattan? Is there a particular rye or vermouth you prefer? Let me know in the comments below, at alex@stagandotter.com, or you can find me on twitter at @larix_laricina. Thanks for reading, and cheers!